Shown above is a surface plot from a bit before 7 am MST this morning of the last day of 2014. New Mexico is covered with arctic air that is just sneaking briefly into southeast edge of Arizona. But arctic air on west side of Continental Divide is pushing steadily southward. There is precipitation across the northwest half of the state with Kingman reporting moderate snow and Phoenix Sky Harbor moderate rain. Still very dry here in Tucson area with 12 UTC morning sounding showing only 6 mm of PW. The CIRA blended PW analysis for 6 am MST (below) indicates that PW has increased to over half an inch in the northern GoC, with winds in low levels bring some of that our way. The early run of the WRF-NAM at Atmo continues to forecast rapidly changing conditions here in eastern Pima County, as the shower bands and cold front move quickly by later today. The forecast skew-T above for TWC is valid at 1 pm MST - this sounding has the max PW forecast here by the model, peaking a bit over 6/10 of an inch. Moisture reaches to 600 mb, with a bit of CAPE below. Freezing level is very low, so some showers of graupel are perhaps possible. The forecast below from the model is of total precipitation through 10 pm MST tonight - the shower bands are completely east of metro Tucson by that time. Model forecasts 2/10 of an inch at airport (or perhaps that point is TWC?) with some parts of metro area around 1/2 inch. Mt. Lemmon area comes in over an inch, which would be around a foot of snow. 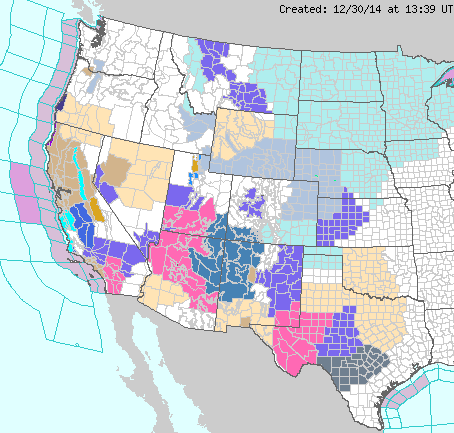 So, we're in for a quick-hitting winter storm as the New Year comes in with a blast. The 500 mb short wave that is digging south along the west coast is centered over central California this morning and continues with very cold air within its core (-36 to -37 C). The system however is fairly moisture starved at this time and is producing precipitation mainly in the Sierra Nevadas. 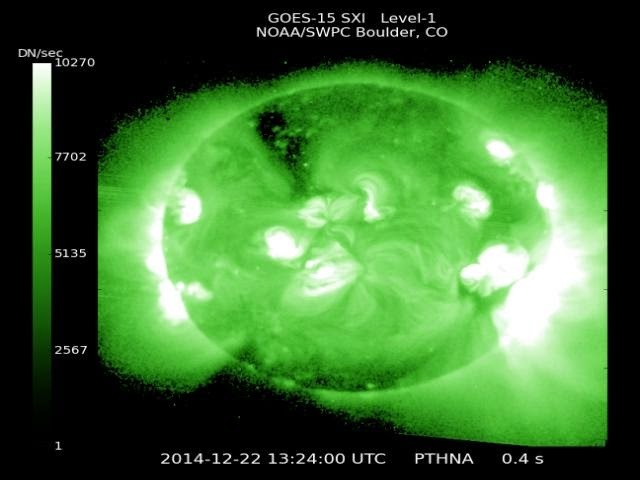 The graphic above shows blended PW from CIRA at Colorado State - analysis valid at 12 UTC this morning (December 30th). The bright blues and browns over Arizona indicate PW less than 1/2" to nearly none. Moisture within the core of the system will impact central and northern Arizona, and we'll have to hope for a nice increase here in southeastern Arizona when the low-level winds become southerly from the GoC - making this event much like the last several. Graphic below shows the NWS 06 UTC NAM forecast of precipitation through 11 pm on January 1st - forecast continues to keep heavier amounts well to our north. This morning's early WRF NAM, also from 06 UTC, keeps significant precipitation over southeastern Arizona through 11 pm on the 1st (above) at high elevations on the Sky Islands. 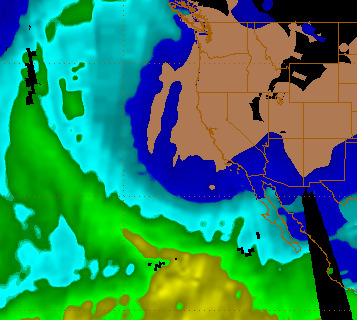 The model forecast of accumulated snowfall for the same period below indicates heaviest snow on the Catalinas and Mt. Graham. The early WRF definitely forecasts the main Arizona impacts from the White Mountains, along the Rim County, and north to the Grand Canyon. The WRF NAM forecast sounding for TWC (NWS Office on campus) shown above is valid at 5 pm MST New Year's Eve. It too is similar to recent events with moisture concentrated below 700 mb, and a nasty dry slot above. There is a bit of CAPE in low levels to feed convective showers along and ahead of the cold front that will come by tomorrow late. The WRF NAM has been under-forecasting precipitation amounts during similar events and this may well be the case again. Finally, the current NWS alert map below indicates a number of winter weather advisories in effect from the Plains to southern California. The widespread wind chill alerts over the Plains reflect the frigid arctic air that has spread southward east of Continental Divide, all the way to the Rio Grande. The most adverse winter weather with the California short wave will actually occur at week's end, as the system moves eastward over the Southern Plains, producing snow and freezing rain as it interacts with both the arctic air mass and the GoM. Developing winter storm is evolving pretty much as forecast by both the ECMWF and GFS long range forecasts a few days ago. The 500 mb short wave that will dig southward down the West coast the next couple of days is over Washington state this morning. Above is 12 UTC 500 mb analysis from NCAR RAL this morning (Monday, December 29th). The wave appears to have closed off (note the south wind at Spokane) with temperatures colder than -36 C within its core. A very strong arctic cold front is accompanying the system southward. By 5 pm MST on January 1st both models (ECMWF above and GFS below) forecast the low to be centered over the Southwest and weakening some. There are still differences in the details of these two forecasts - ECMWF is stronger, with the core of the low a bit further northeast. The key factor in how much precipitation the event produces will depend upon how much moisture the portion of the flow over the Pacific picks up. The most significant snowfall will be produced by upslope flow into the central and eastern mountains. It remains to be seen how low the snow level will drop to over eastern Pima County - probably snow on the saguaros on the east side of town, but iffy down here in the Rillito wash. The early WRF NAM forecast this morning extends out to 11 pm MST on the 31st. The composite radar echoes forecast at that time (above) show a broad band of showers and mostly light rain moving across Pima County. Accumulated precipitation through that time (below) indicates very substantial amounts to the north over the Rim country. 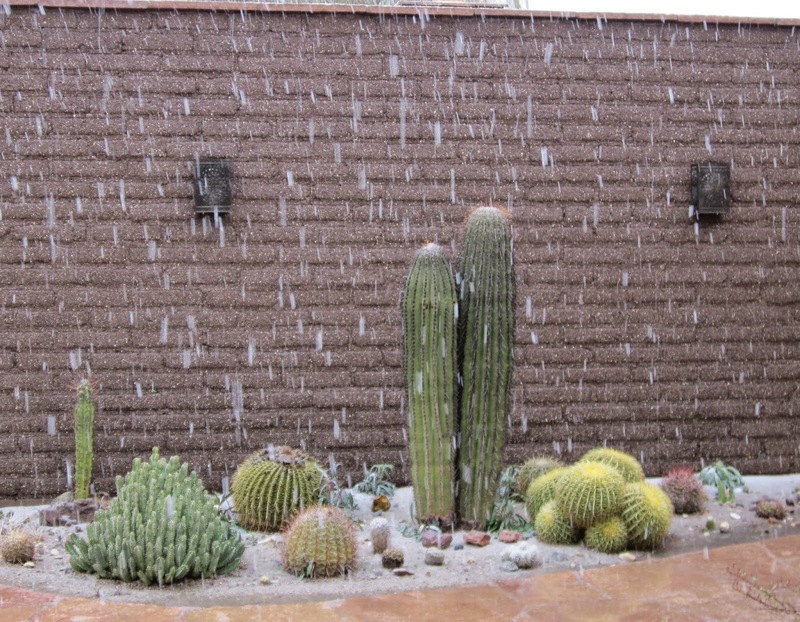 Regardless of the details, 2015 will start off with a significant weather event here in southeast Arizona. 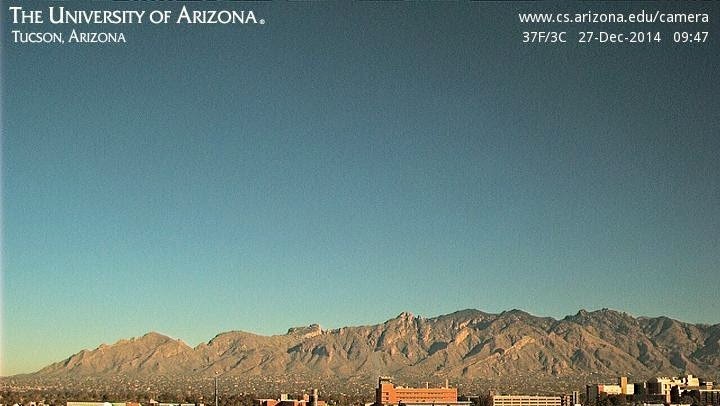 A very crisp and cold morning here in Tucson metro area. Low at the house dropped down to 18 F, making this coldest morning of the Fall/Winter so far. The two graphics here are from MesoWest (Univ. of Utah) and show the 24-hour minimum at a variety of stations spread across southeast Arizona. The NWS had issued a hard freeze warning for the metro area (they define "hard freeze" as being a couple of hours at or below 28 F), and the two plots show that this warning certainly verified. Here at our cold location along the Rillito wash (within the City limits on the north side) we have had morning lows of 28 F, or colder, on 14 mornings this Fall/Winter. The graphic below shows the very cold temperatures recorded this morning over in the San Pedro basin, where temperatures in the teens were common. The very coldest low came in at 6 F - Russ Scott verified the reading at this station of 11 F earlier this Fall, so this is probably also realistic for that particular location east of Tombstone. So, basically a bitingly cold morning here in the desert! A number of posts back, I looked at 240-hour forecasts that were valid at 5 pm MST on Christmas day (yesterday). So here is a brief and simple evaluation of how the ECMWF and GFS did with those 10-day forecasts. I used the NAM analyses at 5 pm yesterday as the verifying charts and these are in the middle at both top (500 mb) and bottom (surface). The ECMWF was amazingly accurate wrt the position of the 500 mb trough over the west. That model was a bit too deep - forecasts heights over southern Utah were about 60 m too low. The GFS was substantially off in both the shape of the trough, its location, and its intensity - 500 mb heights over southern Utah verified 200m+ lower than the GFS forecast. The trough near the northeast was forecast about the same by both models, with the verifying feature being a bit deeper and located about midway between the two forecasts. So, for the West, the GFS was beaten badly by the ECMWF, as it often (usually?) is. The same panels are shown below, but for the surface conditions. Interestingly, neither model did very well with the location or the intensity of the surface low that was over eastern Canada - no clear winning forecast there. But back over the West, the ECMWF forecast was again clearly more accurate than the GFS. When all is said and done, these 10-day forecasts are just unbelievably good from my dinosaur's perspective. When I began working for the US Weather Bureau (January 1967), the PE model (Primitive Equations) was experimental and not at all reliable or very useful at 72-hours! 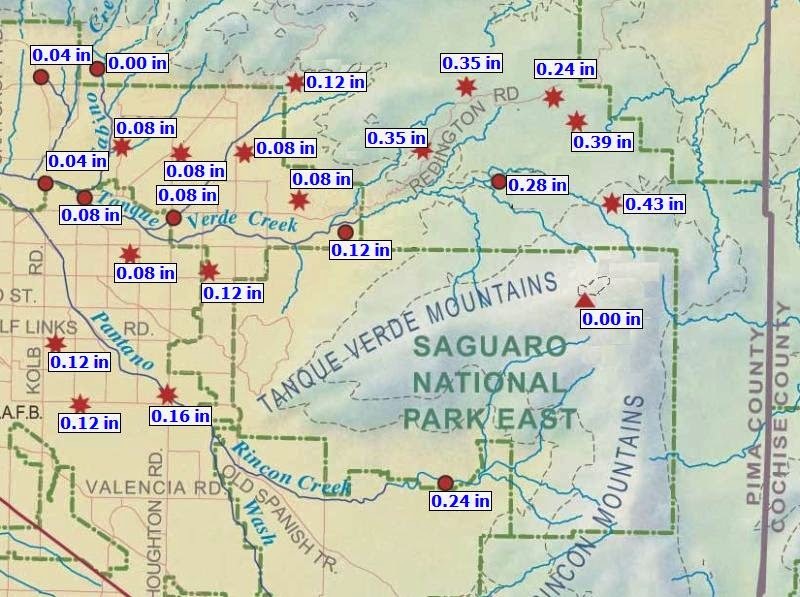 Last evening's precipitation event was widespread across eastern Pima County - areal coverage across the ALERT network was between 90 and 100 percent. The uncertainty is caused by some higher elevation stations receiving only snowfall, which is not measured by the system. The heaviest amounts of rain were recorded in the Redington Pass area (above - 24-h rain through 5 am MST this morning). Amounts over low elevations of the metro area were quite light - 0.06" here at the house. The strongest wind gusts I found for yesterday afternoon were at middle elevations, e.g., Pioneer Airfield (4767 ft MSL) gusts to 49 mph and Douglas (4154 ft MSL) gusts to 47 mph. Higher and lower elevations tended to have gusts around 30-35 mph. Early this morning some of the stations in Cochise County have been reporting light snow. On tap are more cold, frosty December mornings. Shown above is the early WRF-NAM forecast of surface conditions across metro Tucson valid at 6:00 am MST tomorrow morning (Saturday, December 27th). Model forecasts the temperature at many spots to fall into the upper 20s - means that lows here along the Rillito wash will likely be in the 15 to 20 F range. The model forecast of the sounding (at TWC on campus) shown below is also valid at 6:00 am. The very cold and stable surface inversion layer is the layer within which weak, cold air drainage flows develop within and near the Rillito wash. The ECMWF continues to forecast another weather event for the Southwest for the New Years holiday next week. I've shown here the model's 500 mb forecasts for 96-hours and 168-hours (these are valid at 5:00 pm MST on Monday and then at 5:00 pm on New Years Day. The model forecasts a very strong short wave and attendant vorticity maximum to dig southward on the east side of the Pacific ridge and to evolve into a very cold, closed low over southern California on New Years. Snow levels with this system will drop to very low elevations. HAPPY HOLIDAYS TO ALL WHO VISIT HERE! Two photos from our courtyard - snow is from February a couple of years ago. Chiltepin pepper plant above is a volunteer, probably "planted" by a bird. 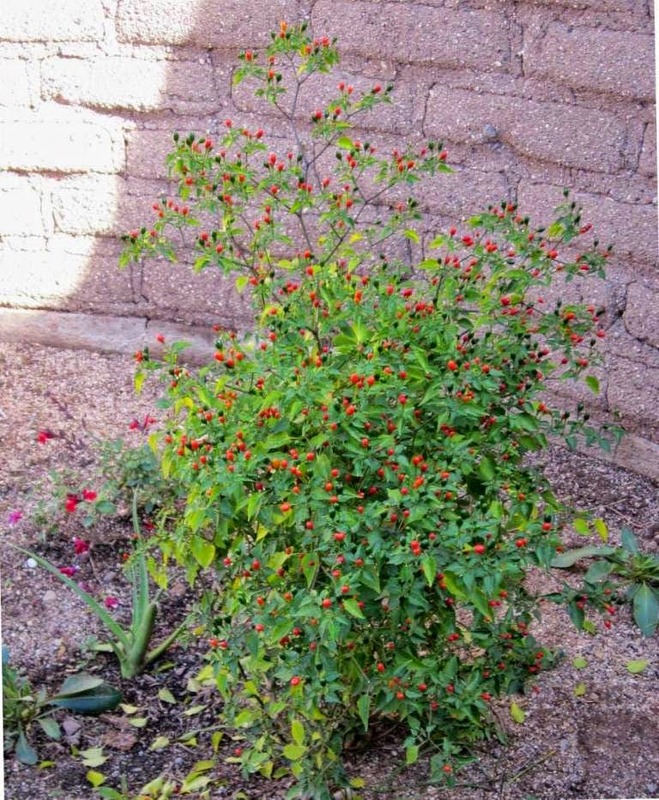 This very small and very hot pepper is the only variety native to the U.S. Photo was taken less than two weeks ago - this bush and many plants on our street, along south-facing walls, are holding up well given the cold, morning lows. and the New Mexico boot-heel. The composite radar echo forecast below is valid at 6:00 pm MST this evening. The long-range, global forecasts continue to bring a cold, closed low and precipitation into the Southwest by New Years eve. The ECMWF four-panel forecast above is valid at 168-hours from last evening (5:00 pm MST on December 31st). The forecast 1000-500 mb thicknesses would bring snow levels down to very low elevations. But of course this is seven days out. Should perhaps be a bit worried about this, since both the GFS and ECMWF are very much in agreement at this time frame. It is another cold morning down here close to the Rillito wash - low has not occurred yet but it is upper 20s out there now. Edited to add - morning low here was 21 F, which ties with November 24th as the coldest two mornings of the winter so far. We have had six consecutive mornings with lows of 30 F and below. It looks like cold period will continue into the new year. Long-range forecasts have a strong and very cold weather system affecting southern Arizona out somewhere around New Year's Day. The early run of the WRF-NAM at Atmo this morning continues to forecast a windy day for Christmas here in southeast Arizona. The 10-m wind forecast above is valid at 1 pm MST tomorrow afternoon. The NWS has issued a wind advisory for Christmas Day for the area shaded in brown on graphic below. I've added details of the NWS advisory that includes an explanation of what this product means here in southeast Arizona. 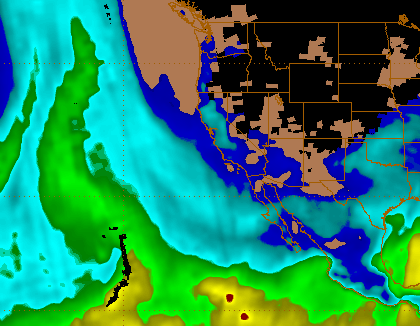 The WRF-NAM continues to forecast light showers with the Pacific cold front tomorrow also. The composite radar forecast below is valid at 6 pm MST. The model forecasts best snow accumulations will occur over the higher elevations of the Chiricahua Sky Island. Shown above is latest NWS NAM surface and thickness forecast valid at 18 UTC tomorrow - Wednesday, December 23rd. The low pressure area over Indiana will be deepening rapidly, bringing winds and heavy snowfall to Lambert Field (St. Louis) and then to O'Hare in Chicago, So travel delays are very likely at those two major airports. Further east, heavy rains and some thunderstorms may impact major hubs from Atlanta north all the way to Boston. So, keep up-to-date if you'll be travelling in the East tomorrow. Here in southeastern Arizona it appears that main impact of the trough on Christmas will be blustery winds. Shown above is the early WRF-NAM forecast of 10-m winds valid at 11 am on the 25th, indicating strong south-southwest winds here in eastern Pima County. By 4 pm (below) the winds have shifted to westerly as the front associated with the trough heads eastward. Looks like strongest winds on Christmas hit at the Rim Country and White Mountains and then shift eastward into New Mexico. The WRF-NAM does forecast some very light showers over the southeastern corner of Arizona Christmas evening. College football wraps up its 2014/2015 football season with a frenzy of bowl games the next several weeks. While there are a few important games coming up, lots of this just seems silly. For example, the Famous Idaho Potato Bowl game was played this past Saturday (Air Force 38 over Western Michigan 24). This name probably should be hyphenated: The Famous-Idaho-Potato Bowl. 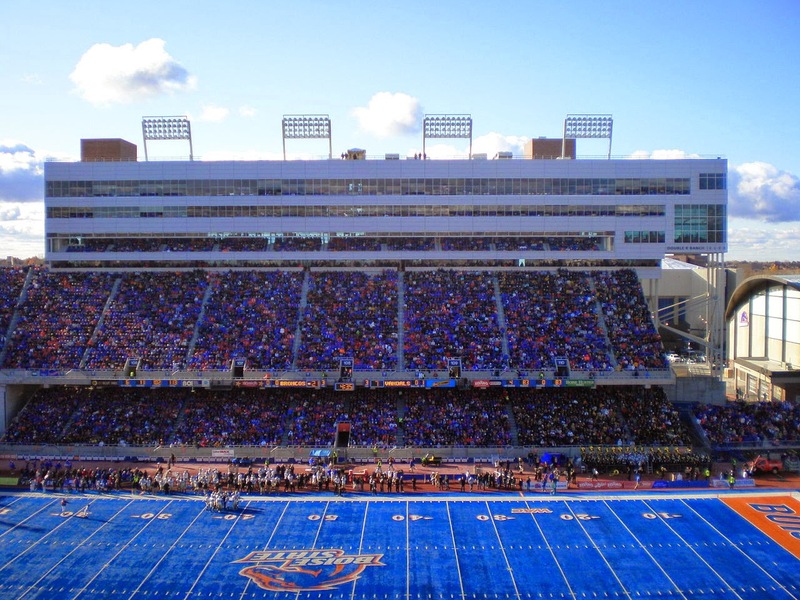 The game was played in Boise at Albertson's Stadium (Boise State University), which has a capacity for 37,000 fans. (A rainy day kept attendance way down this year, with the Idaho Statesman reporting that it appeared there were fewer than 9,000 hardy fans sitting in the stands.) The stadium's real claim to fame is its blue (Albertson's blue) artificial turf (below). The Potato Bowl began back in 1997; before that it was known as The Humanitarian Bowl. Typical payout to the universities sending teams to play in this game has been $325,000. Since we tax payers support the USAF team, it was probably easy for USAF Academy management to decide to head off to Boise. But it's likely that the only way they could have turned a profit for us "stockholders" would have been if they had traveled via USAF blue bus (below) and stayed at the bachelor quarters on Mountain Home Air Force Base south of Boise. As for Western Michigan (Kalamazoo, Michigan) it seems likely that the Potato Bowl was a losing venture in more ways than one. Beware faculty, you may find lumps of coal in your Christmas bonus stockings. Many other Silly Bowl games are in the pipeline this Holiday Season. The winter solstice occurred yesterday afternoon at 4:03 pm MST and "winter" officially began. The most important thing for many of us is that days will now slowly become longer. This winter season begins with solar storms and a seemingly very angry and active sun, as per image below. Bobcat showed up again in the Ferner's yard yesterday - Saturday, December 20th. Photos by John show the bobcat hunting for Christmas goodies among the mesquite trees in their backyard.